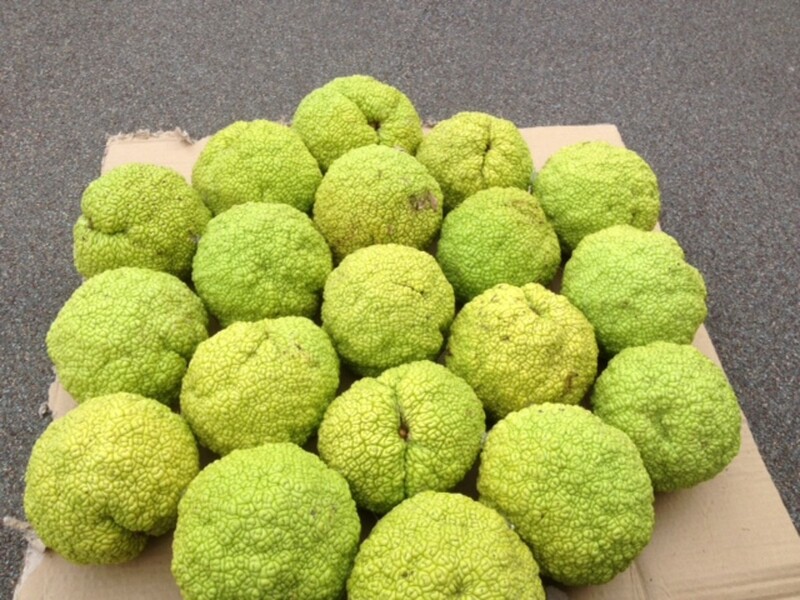 Do you have Osage Orange trees on your property? 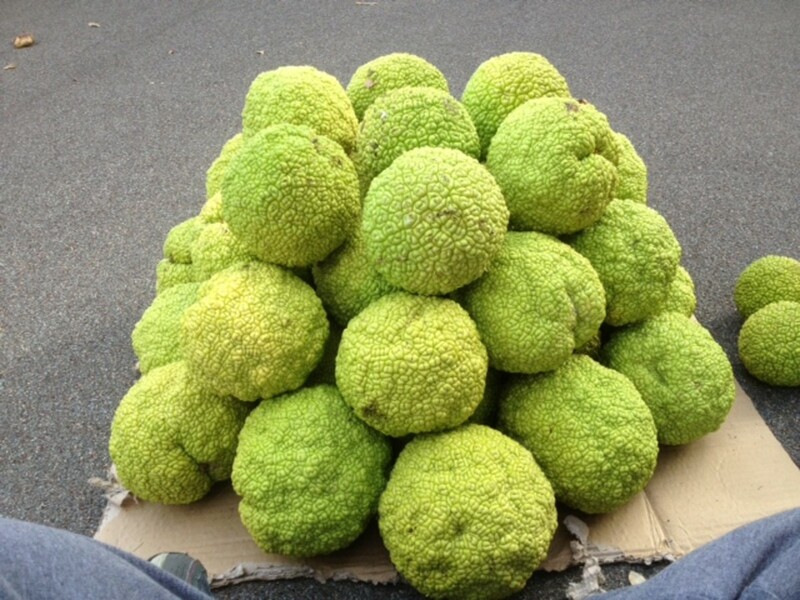 By October, you probably have tons of round green grapefruit size balls all over your yard, called Hedge Apples. Since Hedge Apples are not edible to humans, and animals and aviary tend to avoid them, people struggle with what to do with Hedge Apples. Many people believe that the Hedge Apples contains insect repellant properties, particularly for spiders. This idea has yet to be proven or disproven really. Though, the Horticulture & Home Pest News from Iowa State University has published that, "insect deterrent compounds have been extracted from Hedge Apples in laboratory studies." So, what to do with Hedge Apples? You can place Hedge Apples in the basement and around the foundation of your home to repel spiders. 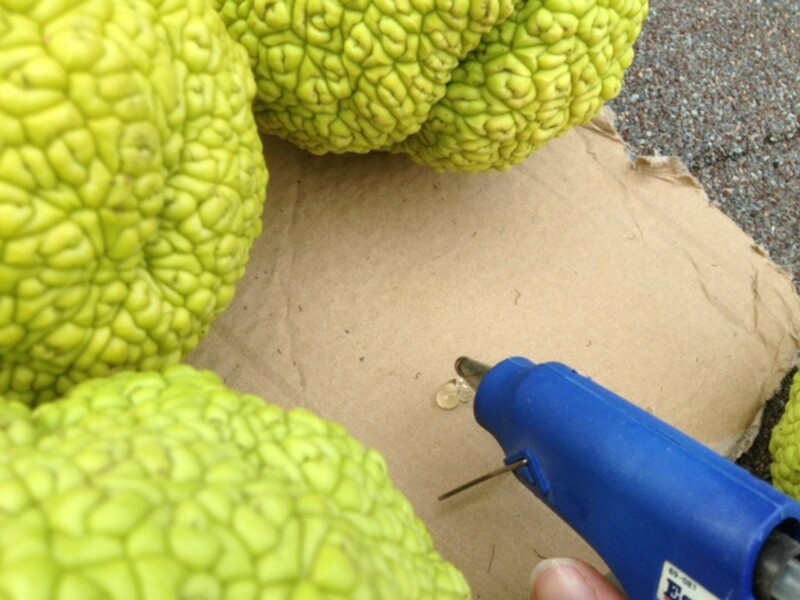 But, one Osage Orange tree can drop dozens of Hedge Apple fruits each fall. What do you do with the rest of them? We have probably seven or eight Osage Oranges trees on our property, so you can imagine the number of Hedge Apples we get each fall. 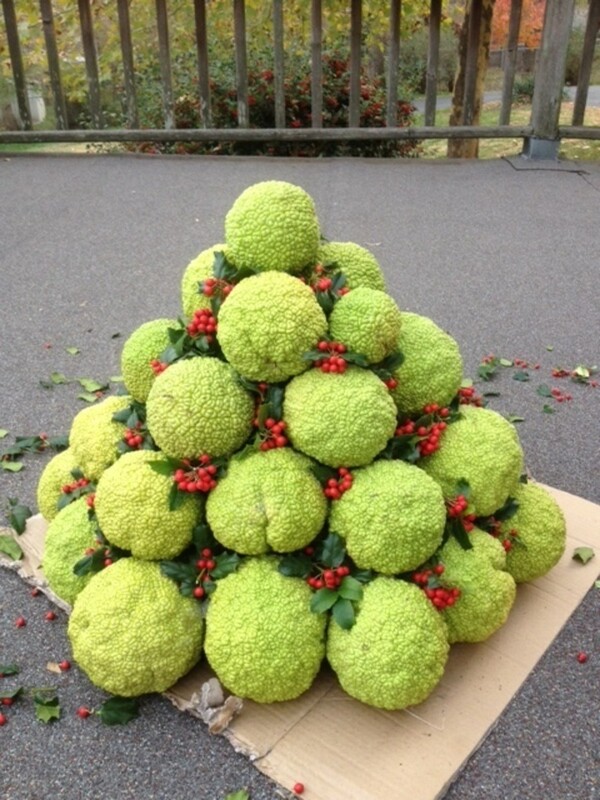 One day, I decided to see if I could come up with an outdoor decoration made of Hedge Apples, and thus the Hedge Apple Christmas Tree was born. 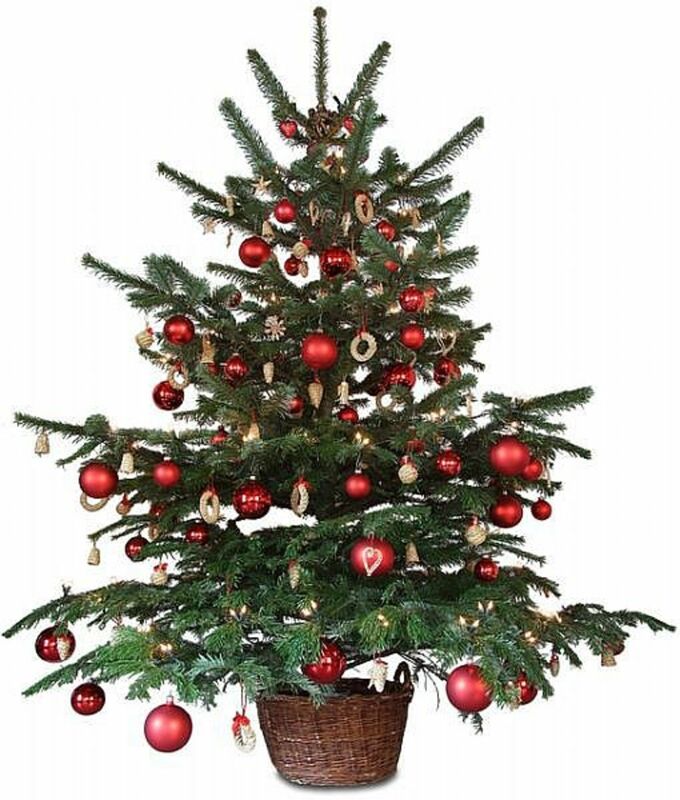 The plywood base makes it easier to transport the Hedge Apple Christmas Tree, if you plan to construct it in one place and then display it in another. The shellac can help preserve the Hedge Apples longer and give it a shinier look. However, this may decrease the spider repellent properties. 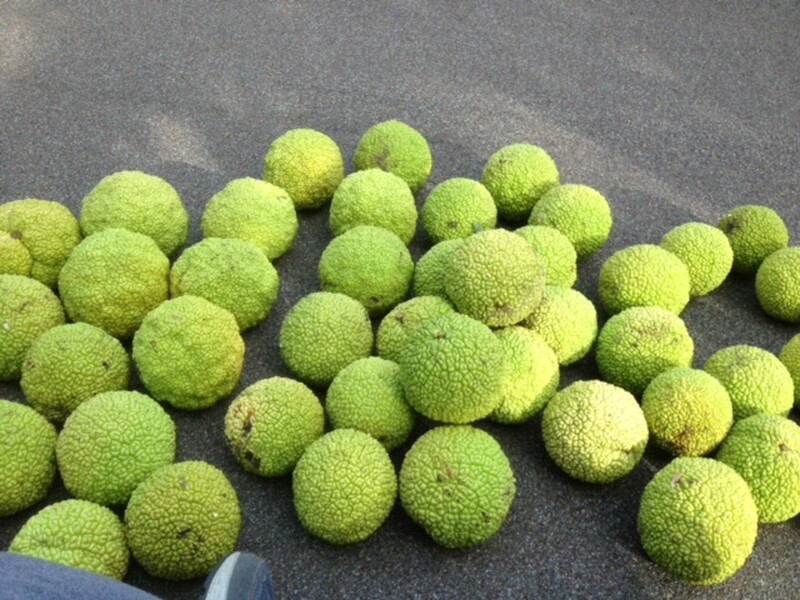 The first step in making Hedge Apple Christmas Tree is to collect the Hedge Apples. 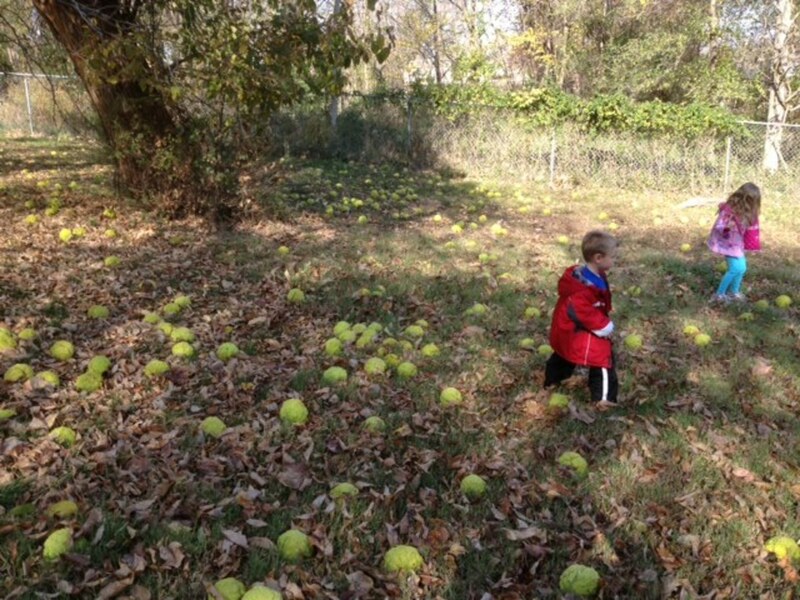 We made a game with the kids of collecting different sized Hedge Apples all around the property. We were careful to select ones that had not started seeping or rotting. We wanted the decoration to last as long as possible. The amount of Hedge Apples you need will depend on how large of a Hedge Apple Christmas Tree you are wanting. How many layers high? How big around? For the Hedge Apple Christmas Tree in the picture above, we collected probably 50 Hedge Apples, but only used about 30. You want to use the largest Hedge Apples to form the base layers and as you go up in layers, decrease the sizes, until you are using the smallest for the very top layer. Note: If you are using a plywood or other wood base, you can also use nails or screws to "spike" the base layer of Hedge Apples and create a more firm base. The next step is to begin building the base layer of the Hedge Apple Christmas Tree. Our first Hedge Apple Christmas Tree, we did not think about having a solid base. We simply used a piece of cardboard to keep the hot glue from spilling on the deck. Cardboard is not strong enough to support the weight of even the smallest Hedge Apple Christmas Tree. I highly recommend using a piece of plywood or firm base to build the Hedge Apple Christmas Tree on. 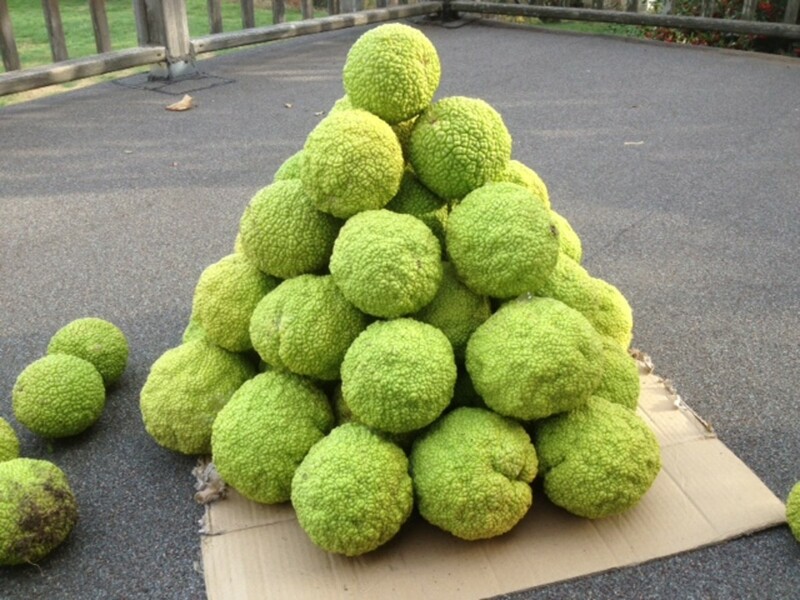 By having a solid base, it allows you the opportunity to build the Hedge Apple Christmas Tree in one location and move it to a different location. Select the largest Hedge Apples to form the base of the tree. Keep in mind that the wider you make the base, the taller the tree will be. We hot glued each Hedge Apple to the base (cardboard) and also to each other. To make the base stronger, you can also use toothpicks and push one end into one Hedge Apple and then attach the other Hedge Apple before glueing. Once you have completed the base of the Hedge Apple Christmas Tree, you can begin adding the layers. 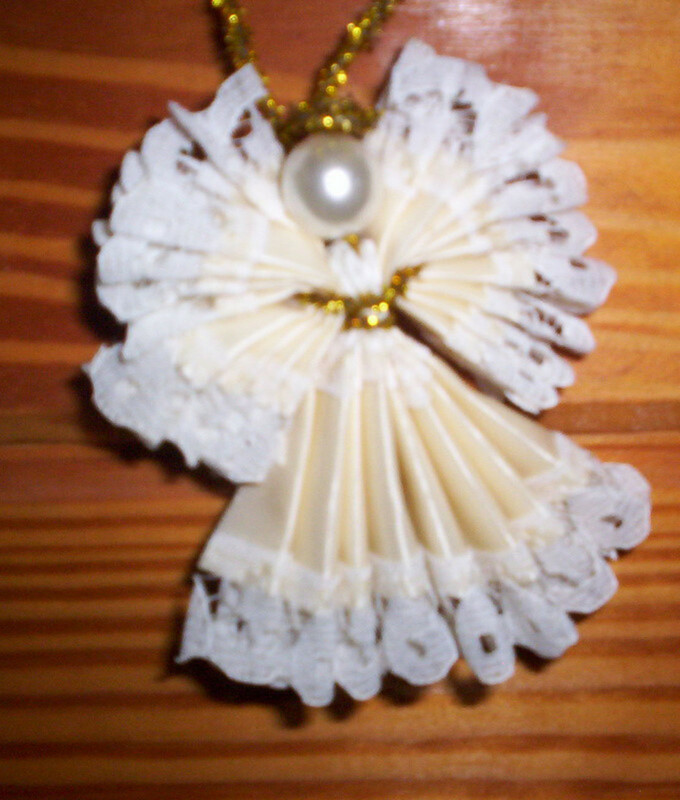 Use the toothpicks and hot glue gun to attach each layer to the previous layer. Each subsequent layer should be smaller in diameter than the previous one. Make sure you use smaller sized Hedge Apples as you go up each layer. When you reach the top layers, you should be using the smallest size Hedge Apples. The last layer of the tree should be made up of one Hedge Apple and it should be the smallest. 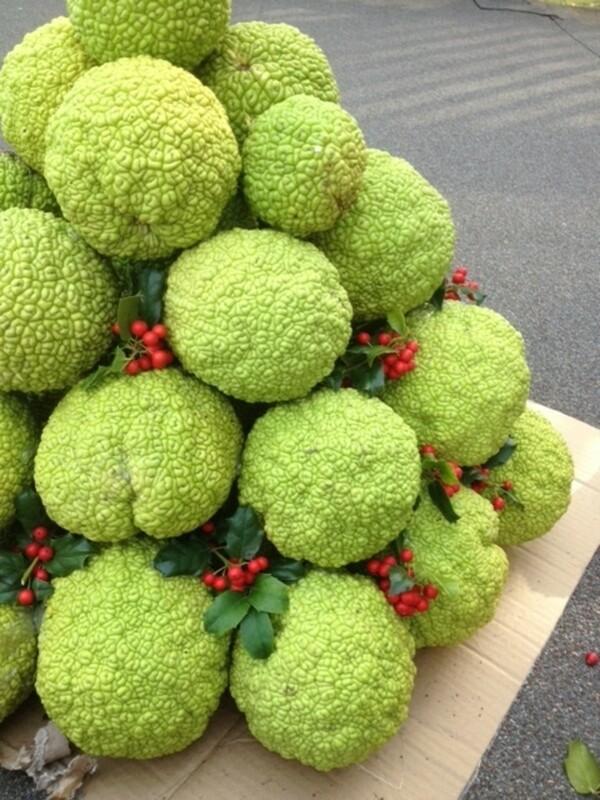 The last and final step of making the Hedge Apple Christmas Tree, is the most fun. Now you get to decorate it!! We have a giant holly bush in our yard that produces dark green leaves and rich red berries. 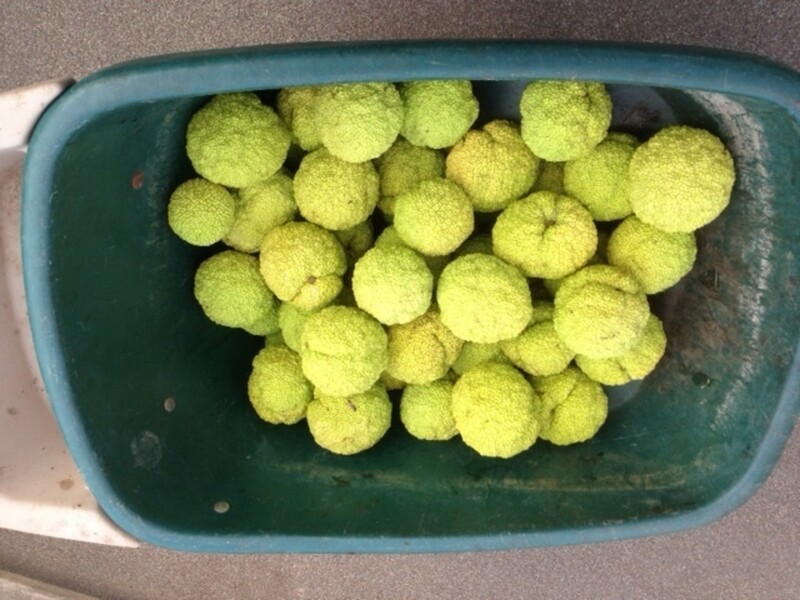 They were perfect to cover the large gaps in between the Hedge Apples. We simply used gardening shears to snip small branches of the holly bush and hot glued pieces in the gaps of the Hedge Apples. 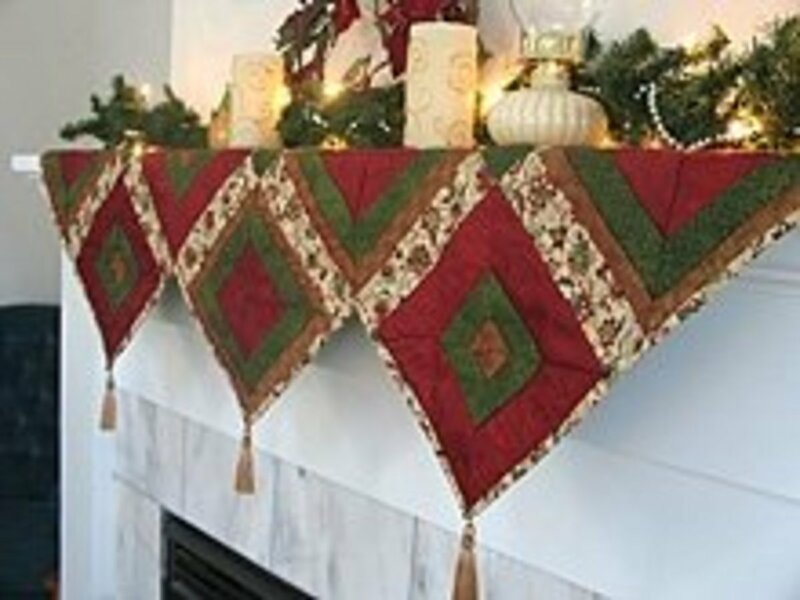 The shape of the holly leaves are very Chistmasy, but you can use other items to decorate the tree. Now that you have completed your Hedge Apple Christmas Tree, you have not only a great home made outdoor Christmas decoration, but also a very pretty and unique spider repellent! Do you think Hedge Apples really repel spiders and insects? The Hedge Balls I picked up this season for the first time are turning brown pretty quickly I am trying to use them in some decorations this year for fall. Is there something you can spray on them to make them stay fresher or green longer? What a wonderful color they have! I am definitely going to be on the lookout for someone with a Hedge Apple/Osage Orange tree. Thanks for sharing your delightful tree with us. I'm seeing a large outdoor wreath, a garland brightened with this color and texture, a large topiary shape covered in these round balls of lively color, a basket filled with a happy hello by the front door… :) Wonder if they could be cored and cleaned out to make candle cups for a frosty nighttime welcome on a front walkway. I'm going to see if they grow in our area right now. 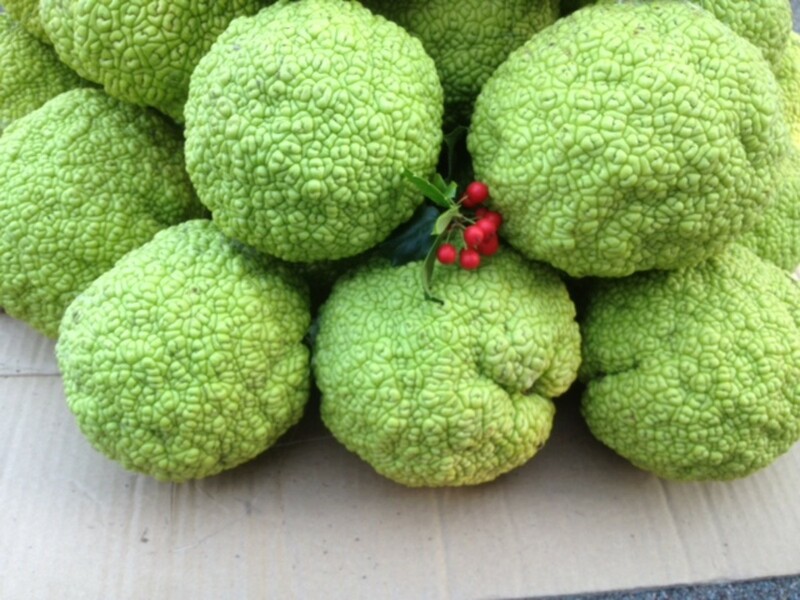 This was really interesting, as I have not seen or heard a hedge apple before. This could be the solution to the harmful chemicals in most insect repellents. Thanks for posting. I never thought to slice them and dry. We will certainly have to try that next fall. What do you recommend to use to slice them? I like your Hedge Apple Tree...very easy and attractive. Aside from the purported use of these fruits as spider repellents ( I did not find this to be true for our house, but I did not use very many around the area.) they make lovely dried 'floral' arrangements. You thinly slice the apples, dry them if desired or arrange them green, on sticks as a bouquet. Each slice is a round detailed flower, and the browned color it becomes is attractive in its own way. 'Somebody' needs to find a good helpful use for these common fruits....agreed? What a unique idea!! We have Hedge apples on our property too and I have always thought they were a waste. I never knew what to do with hedge apples. I am definitely going to try this. Thank you for the positive feedback. I must say I am a big fan of your hubs, so it feels really good to have you read one of mine and find it useful. Now, that's very creative! Our city has a few of these trees along Riverside Drive and now the residents can put the Hedge Apples to use. They fall everywhere and clog the scenery and even part of the road. Merry Christmas! Rated Up and several more. I had never heard of them either until we bought our farm and we had Osage Orange trees. Thanks for reading and the positive comments.